Andrea Parkins is a composer, sound/installation artist and improvising electroacoustic performer who engages with interactive electronics as compositional/performative process, and explores strategies related to Fluxus’ ordered, ephemeral activities. An integral participant of the New York sound art and experimental music scene - and worldwide, she is known for her pioneering gestural/textural approach on her electronically-processed accordion and self-designed virtual sound-processing instrument. Described as a "sound-ist," of "protean," talent by The New York Times music critic Steve Smith, Parkins’ laptop electronics and Fender-amped accordion create sonic fields of lush harmonics and sculpted electronic feedback, punctuated by moments of gap and rift. Parkins’ sound works include multi-diffusion site-based installations featuring amplified objects; electroacoustic solo and ensemble pieces; electronic music compositions; and live scores/sound design for dance and film. Her work has been presented at the Whitney Museum of American Art, The Kitchen, Diapason, and Experimental Intermedia; and international festivals/venues including Mexico City's 1st International Sound Art Festival, NEXT in Bratislava, Cyberfest in St. Petersberg, and q-02 in Brussels. Parkins also records and performs as a solo artist and has collaborated with sonic innovators such as Otomo Yoshihide, David Watson, John Butcher, and Nels Cline, among many others. On an ongoing basis, Parkins develops her primary performance project, a series of interactive audio/visual works inspired by Rube Goldberg’s circuitous machines. In Fall 2013, in addition to an artist’s residency at q-02 in Brussels, where Parkins will create a new multi-diffusion work, she will tour in Europe with her solo project, Faulty (Acts). Parkins’ recent projects include Austell 1, a live 8-channel performance/installation, funneling real-time sound from the rail yards of Long Island City, Queens into an adjacent reverberant warehouse space, with sonic interventions from a walking bell-ringer and Parkins' accordion feedback and amplified objects, presented in by Fragmental Museum’s Incidental Music exhibition in June 2012. This past winter, she performed a new audiovisual work at Experimental Intermedia, curated by Phill Niblock, in collaboration with Portuguese video artist Ana Carvalho and sound artist Ben Owen. She also toured with her solo electroacoustic performance project with performances in Poland, Italy, Brussels and Paris. In March-April 2013, Parkins’ multi-diffusion Faulty (Broken Orbit) was featured at MADA Gallery in Melbourne, Australia in “With Hidden Noise,” a sound art exhibition curated Stephen Vitiello, and her “portable" sound work featured at Cyberfest in St. Petersburg, Russia. Parkins was invited to perform her interpretations of seven graphic scores by Christian Marclay at the Whitney Museum’s 2010 retrospective festival of Marclay’s work. 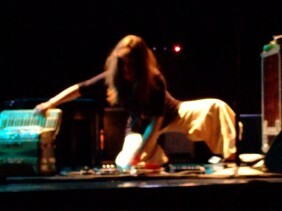 Since 2009, Parkins has toured throughout Europe with choreographer Vera Mantero’s production: We Are Going to Miss Everything We Don't Need for which Mantero commissioned Parkins' live electroacoustic score, featuring amplified performers, objects and surfaces; and since 2010, Parkins has performed her live 12-channel sound design for Symptom, an intermedia performance piece, commissioned by The Body Cartography Project. Parkins’ recordings have been published by Important Records, Atavistic, and Creative Sources, and her work has received support from American Composers Forum, NYSCA, the French-American Cultural Exchange, Meet the Composer, Harvestworks Digital Media Arts Center, and Frei und Hanseastadt Hamburg Kulturbehoerde. Parkins is on faculty at Goddard College’s MFA in Interdisciplinary Arts program.